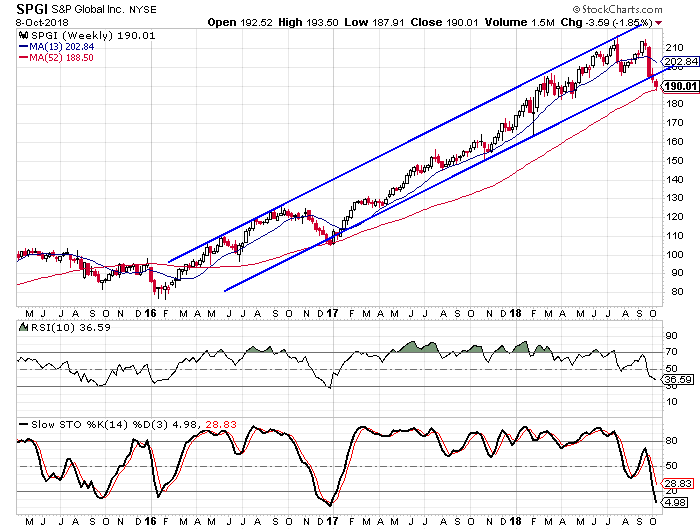 S&P Global (NYSE: SPGI) – You are probably more familiar with S&P Global as Standard & Poor’s. The company was founded in 1860 and became Standard & Poor’s in 1941. The company was acquired by McGraw Hill in 1966 and changed the name in 2016. While most investors are familiar with the index benchmarks like the S&P 500, the company also provides ratings and does extensive work with analytics. The company is headquartered in New York. SPGI’s earnings have been growing at an impressive rate in recent years. The average annual growth rate for the past three years is 22%. Earnings grew by 26% on the report in July and analysts expect full year earnings growth of 24%. The company will report earnings again on October 25. Sales have been growing at a slower pace, but they have been consistent. The average annual growth rate has been 7% over the last three years and they also grew by 7% in the most recent quarter. Looking at the management effectiveness ratings the return on equity stands at 84.1% while the return on assets is at 20%. The profit margin is at 44.6% and the operating margin is at 45.9%. All of these measurements are well above average. SPGI has been trending higher since the beginning of 2016, gaining over 160% at its peak just a few weeks ago. The stock has been moving higher within the confines of an upwardly sloped trend channel and the stock is just a tad below the lower rail at this time. The 52-week moving average is just under the current price and should act as a secondary support level. We also see that the stock is the most oversold it has been since late 2016 based on the 10-week RSI and the weekly stochastic readings. Suggested strategy: Buy SPGI with a maximum entry price of $200. I would set a target of at least $260 over the next 12 months (for a potential return of 35% from current prices). I would also suggest a stop at $180.